"We are incredibly humbled by the outpouring of support from so many people around the country, who are standing with SOA Watch and for our First Amendment rights," Voss said. The organizer said nearly 7,000 people signed an online petition presented to the city, which also received letters opposing the restricted permit from 75 human rights, peace and religious groups. Those groups included Pax Christi chapters, 10 chapters of Veterans for Peace, at least three orders of Catholic sisters, the Presbyterian Peace Fellowship, and the Catholic social justice lobby NETWORK." 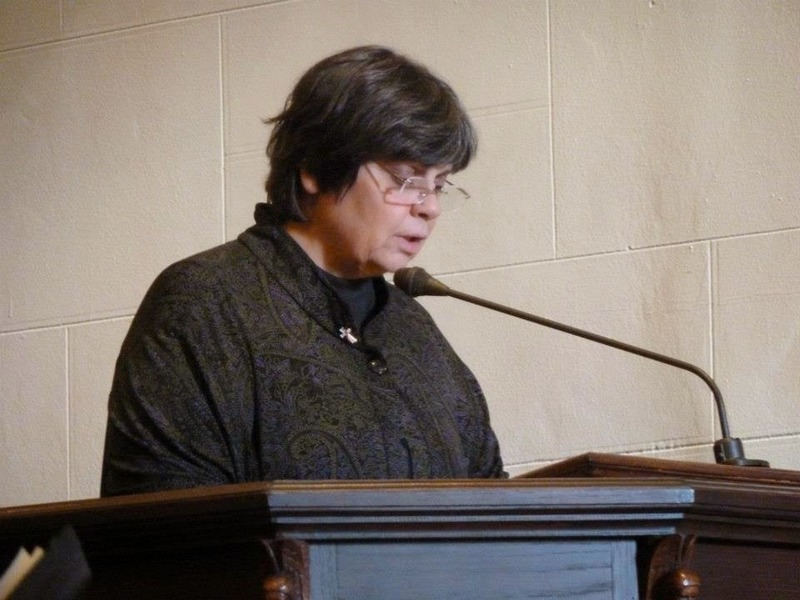 Janice Sevre-Duszynska, ARCWP with Fr. 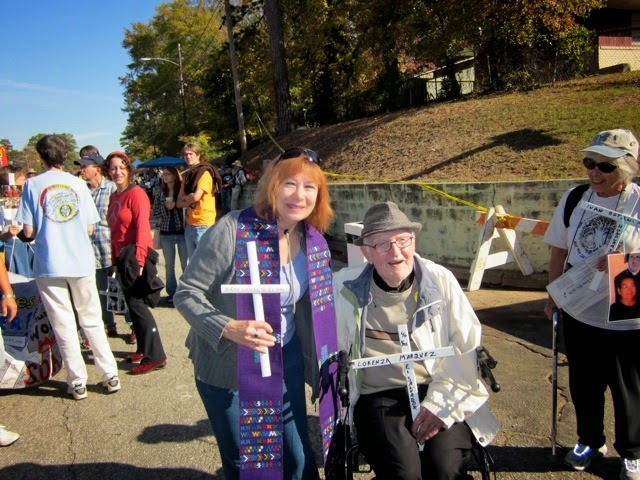 Bill Brennan, a Jesuit Priest at SOA Vigil in Ft. Benning. Padre Bill died in Aug. 2014. Now he continues to support justice with the communion of the saints. 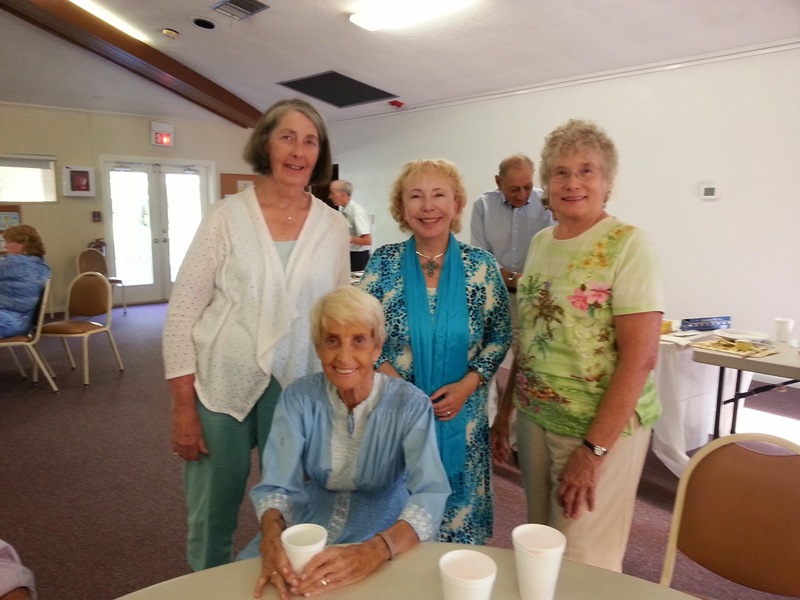 Jolinda Grandma Harmon, family Matriarch, passes on her faith and her family to Brings Good Shepherd Church regularly. 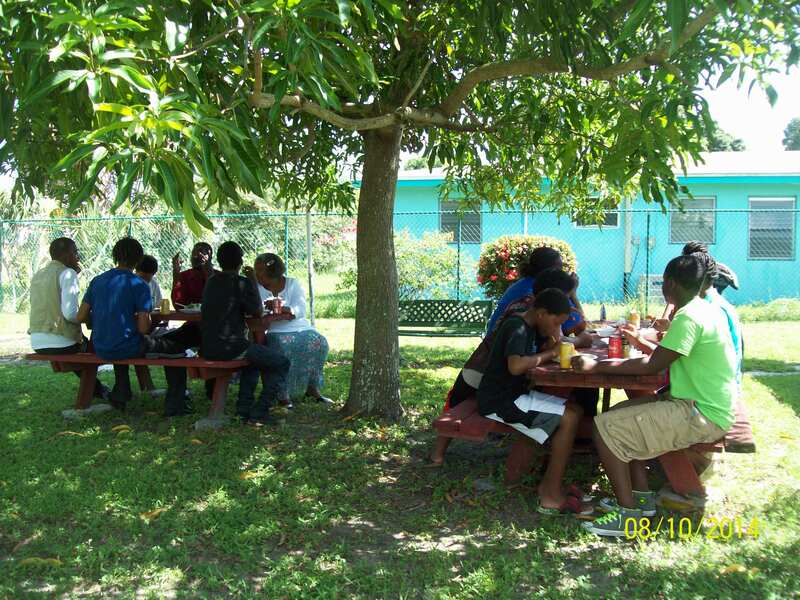 Here they are eating together in the church yard after church. I am not sure That authority is a "good" word These Days. Earlier on in our nation's history the authority of parents, teachers, clergy, elders, police and a host of others was taken for granted. 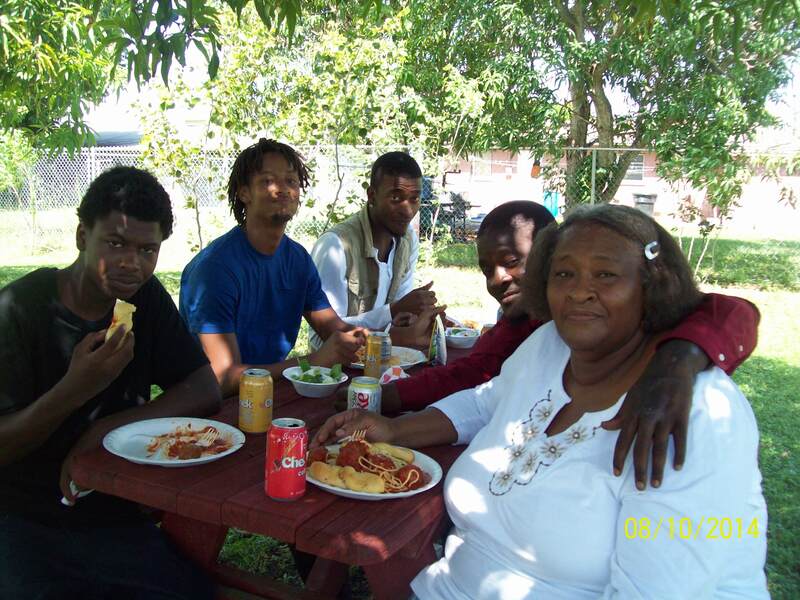 When I grew up all my Grandmother Would have to do was look at us and we where Immediately in line. And, any adult on the block Could discipline me if I did something questionable, like climb over someone's fence or play with my friends on the stacks of long pipes in the big "pipeyard" in the middle of our block. Some de esta discipline probably saved my life or at Least my limbs. But having gone through the 60's, 70's and 80's authority was, in most places, turned upside down as a positive attribute. Sometimes respected Those eleven objects of ridicule Become now. A few weeks ago here in Florida there was a lot of TV coverage of a new activity Among teenagers. They would see an older person in some vulnerable position, leaning on a cane or bending over to pick something up and run up behind them and kick them very hard in the rear knocking them down with great tirades of laughter. They would then post on this media social. It was not until there was public outcry and law enforcement action This New That "joke" Lost its meaning and died out. Here in Fort Myers community rallied around an old man who was kicked down while tending his garden. They came and planted for him. It was a beautiful response. But, That did not mean That would be respected elders, just that they 'would not be particularly ridiculed in That way. Many elders know very well about the culture of youth and "beauty" that Prevails today and That They are the last to be hired and the first to be fired DESPITE years of Relevant experience. And many parents and teachers simply throw up Their hands and say: what can I do, they 'do not listen to me! We know a great deal Also acerca abuses of authority: parents who severely abuse and neglect children, teachers who engage in sexual activities with Students or Otherwise abuse them, priests and other clergy who sexually abuse children and parishioners, church rules That bully people in the Most private areas of life, older Employers who exploit the work of young and vulnerable workers and some police who profile and even kill instead of protect the vulnerable. All of These things Promote a distrust of "authority". But is "authority" such a bad word? In the recent tragic case where a white police officer killed Michael Brown, an unarmed young black man, in Ferguson, Missouri, the initial community response was understandably despair and outrage and then chaos ensued with looting and robbing. This continued until a respected black officer, Captain Ron Johnson from the Highway Patrol was Given jurisdiction in Dealing with the people instead of the local police department and restored the order and a positive climate where each person Could Be Heard. All Agreed That working on race relations in Ferguson absolutely needed to happen and Could Be a legacy de esta tragedy. Captain Johnson Had the Formal authority / power of law enforcement from the Governor and the Highway Department and the casual Given authority by people who trusted him. This was the more essential Latter authority brought` That some peace. Power May Come from above but true authority comes from the bottom up. The situation Remained peaceful with His assistance until more details of the case surfaced in a way That further upset the community and others concerned, then chaos ensued again and the militaristic response further alienated far beyond the community. In the midst of chaos positive gentle yet firm like Ron Johnson's authority is truly a welcomed gift. Indeed it Is that kind of positive That authority can pave the way for peace and forgiveness in even the Most horrible of times. The readings today to ask Whom does God give spiritual authority, and authority for what? In the reading from Isaiah 22:15, 19-23, God is giving authority of the overseer to Eliakim who is loyal to God, to care for the house of Judah, the "key" Symbolizes His authority in Judah. The writer of the Gospel of Matthew is concerned With Authority. In the Gospel for today (Matthew 16: 13-20) Jesus Gives spiritual authority to Peter and the disciples / community of believers. Earlier, as Jesus finishes his "Sermon on the Mount" Matthew says That Jesus Taught "as one who HAD authority" not as an ordinary teacher and This amazed the crowds (Matt 7:29). In Matt 9: 6 Jesus says that ". The Son of Man has authority on earth to forgive sins" To show this "authority", after forgiving the paralyzed man's sins, I Told him to "get up, take up your mat, and go home of "which the man Immediately did. In the same place I've ASKs Which is harder- to forgive sins or to say "get up and walk"? Clearly, Jesus the Christ Had the authority from God to His loving Abba do both. Sin is Often ignored in theology and Christology today, another "bad word". But, For Those Who Know They have deeply wronged another or others, without the forgiveness of That from the other (s) and indeed from God is so important. One young man came to me recently and said, "I need peace with God after what I have done." A woman shared with me That she found herself more forgiving others Easily Because she feels she has done That many Things That God awful Already have forgiven and she is relieved of the burden of guilt. But it is the forgiveness of sins that is so hard! When Jesus passed on the "keys of the kingdom" or spiritual authority ACCORDING to the Aramaic idiom, to Peter in today's Gospel (Matt 16:19) Also have is passing on the authority to forgive. But this is said to Peter and to the whole group of disciples as the first question about who people think I have is was Asked of all the disciples and right after This exchange with Peter and the group I tells the disciples to keep it quiet That I is the Messiah. We as Christ followers, called by God DESPITE all our human faults, Have the power, the authority, to forgive one another and to catalyze forgiveness. In the day's Gospel Jesus has gone to Caesarea Philippi. This is a city acerca twenty miles north of the Sea of Galilee is named after That the emperor Caesar and Phillip, the son of Herod the Great who ruled In This territory. Caesar Claimed to be the Son of God. This location Establishes context for the text. Whom the disciples Jesus ASKs people say I is. When Peter answers That Jesus is the Son of the living God, I Also saying That is Caesar, the Roman Emperor is NOT the Son of God. Jesus then says to Peter That This revelation is from God. Indeed, This Relates to the text from Paul's letter to the Romans (11: 33-36) In Which I says! "How the unsearchable ways of God" and ASKs, quoting Isaiah 40:13, "Who has the mind of God Known counselor or God's Been "? In other words, God chooses whomever God wants to serve God and Establish the kingdom (kin-dom) -reign-of God. Who would have ever thought That Peter, Whose nickname in Aramaic "Kepa" means "brick-headed", close to "stupid", and who have misunderstood so many things about Jesus, would be Chosen to know the identity of God-Jesus- the Christ, the Messiah. Similarly, God called Jeremiah When I was a youth and Moses When He was old and tired and Mary of Magdala Also Whom Jesus healed completely of all that was not right with her, choosing Mary to be the first one to see Jesus after the resurrection. Who can know the mind of God? Who would have thought any of Those or the impetuous Peter would Have Been Given any singular recognition? I like the way the TIB Priests for Equality translation renders Peter's call: "I also tell you this:. Your name is now 'Rock' and on bedrock like this I will build my community ..." Peter and Those Who are 'bedrock' like him are to be foundational in building Christ's community-the church. The Aramaic idiom for "Upon This stone" also means "Upon This truth" referring back to Peter's saying That Jesus is the Christ. The church is built on Christ. Peter, a fisherman poor, illiterate, fast-mouthed, hot-headed, impetuous, and half of the time misunderstanding Jesus is to be a bedrock stone of the church, and the likewise Continues God in our time to keep on building It With imperfect living stones. Jesus the Christ is the cornerstone and Peter, Mary of Magdala and all of the disciples THROUGHOUT the centuries are foundation stones of the church living as each of us can be. God Continues to build it here and now, with choices Often That surprise us. 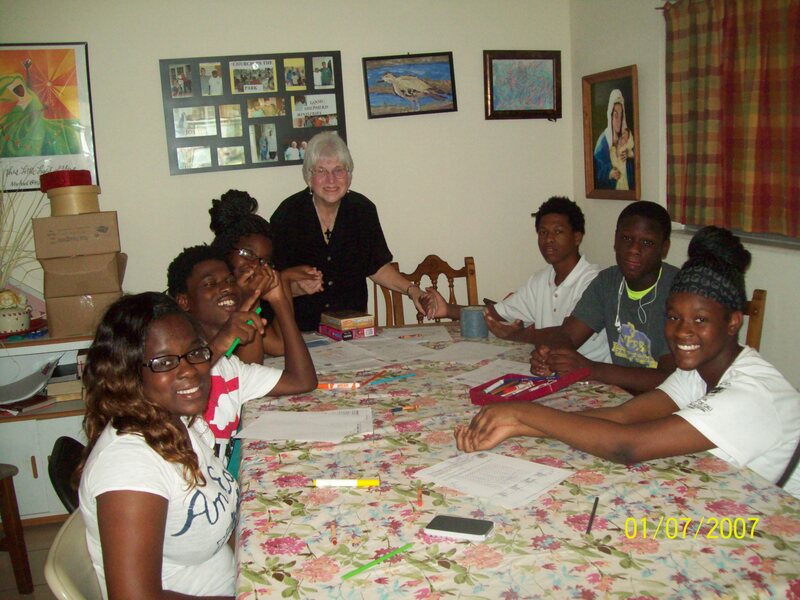 Grandma Harmon, 63, pictured above, was "unchurched" until she came to Good Shepherd as one of the first families in 2008 In passing on her faith, she has seventeen family members brought` Regularly who worship with us. The elder of our Good Shepherd Church, a 62 year old formerly homeless black man and I have an identification with Peter in common. 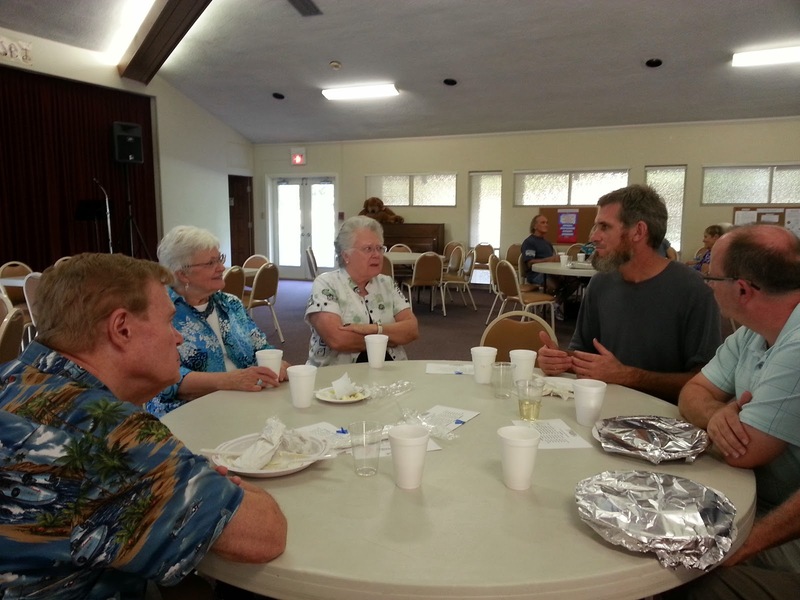 Sometimes we sit and share our Peter-like ways and marvel That God has Chosen us to serve and build the church. The elder, Harry Lee Gary is a devout man who lives the Gospel. He took Peter as His Baptismal name. Harry's life was hard before I met up with Christ who offered Preferred complete the balm of forgiveness after the tragic accidental death of the mother of His children. Even after this life saving encounter with Christ says That I've made many serious mistakes That led to homelessness and isolation. 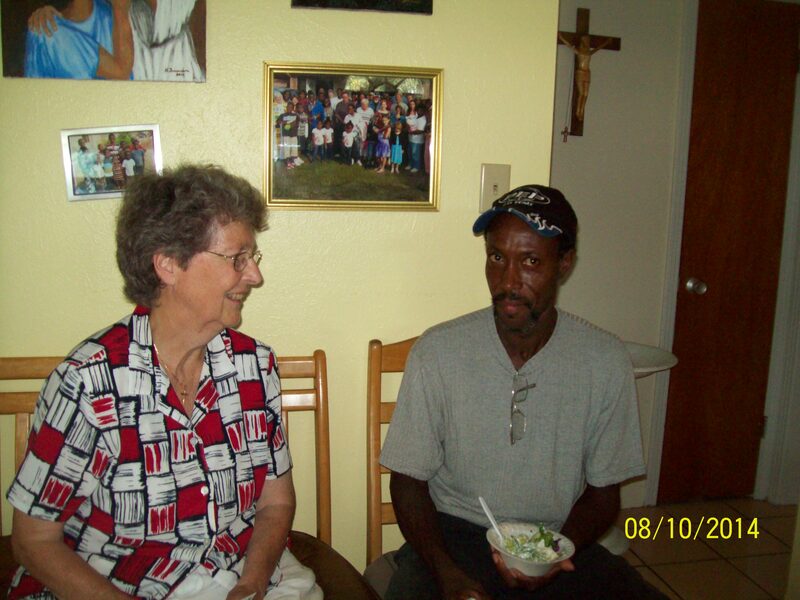 When I Encountered again the love of Christ in our Church in the Park Ministry in 2007 I Began to forgive others and to turn His Life around inspiring all around him to do the same. He has-been foundational in our church ever since. He preaches at every Mass with me. What is written here is always incomplete without His testimony and inspiration of others and That That after eating the portion of This That I Share with the church. Our Peter and I are thankful That God still chooses the imperfect of this world to build the church. And for that grace we say "Amen!" 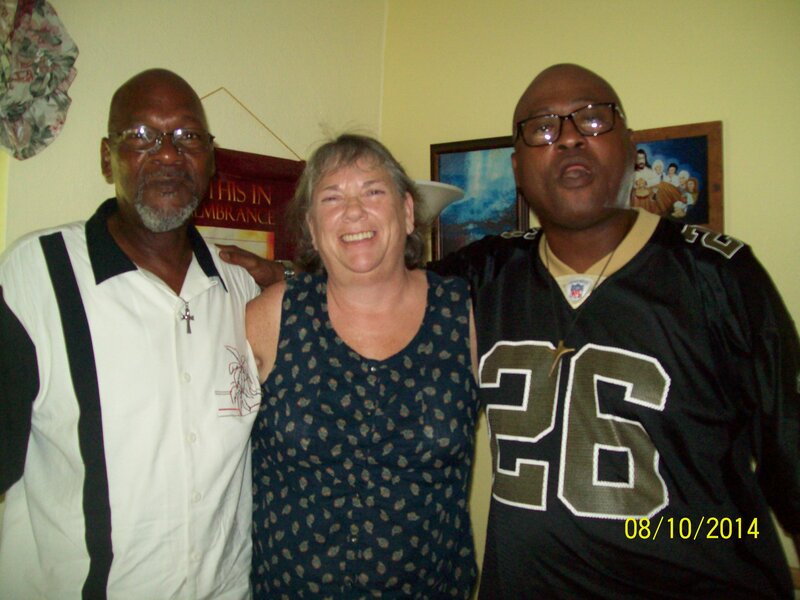 Church Elder, Peter Harry Lee Gary on left with Rose Large and Nathaniel Chester, other church leaders. 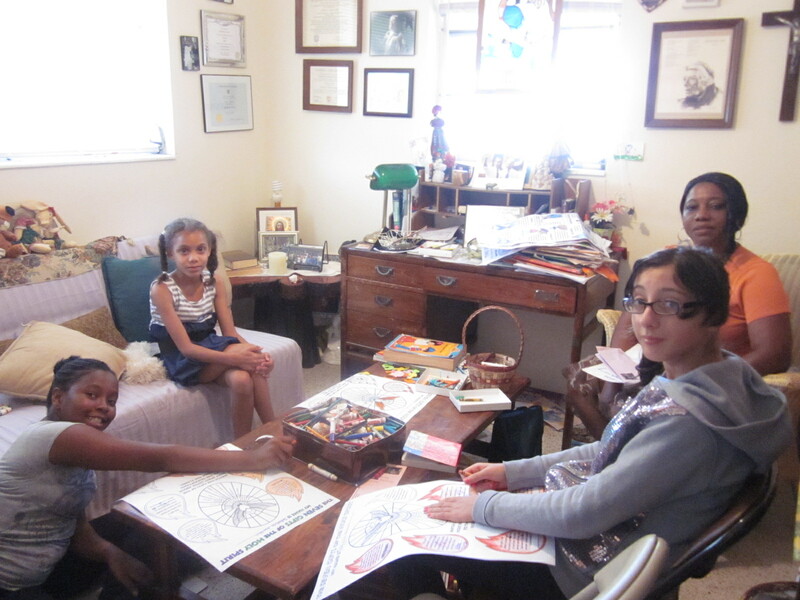 Pearl Jane Efe Cudjoe and Cudjoe, When she is home from Brown University, Junior Class are our teachers. 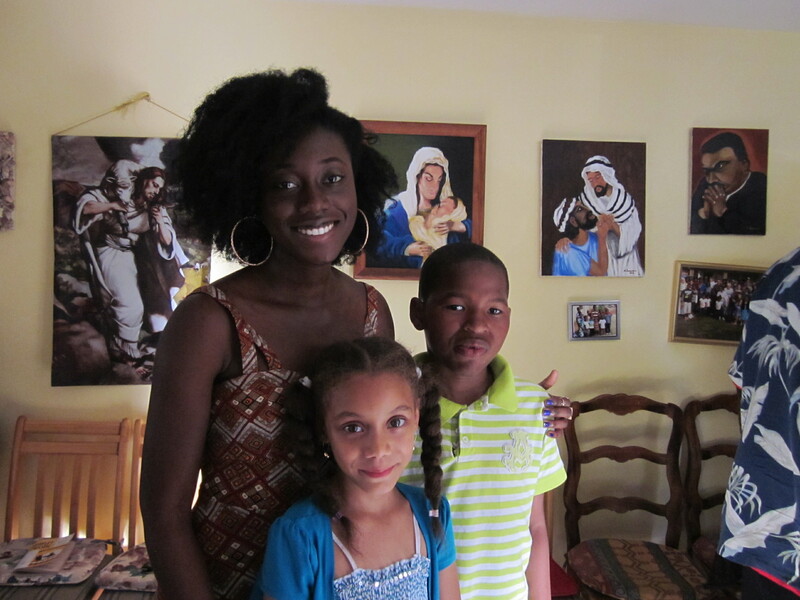 Efe Jane with class members, Joelle and Keion this summer. 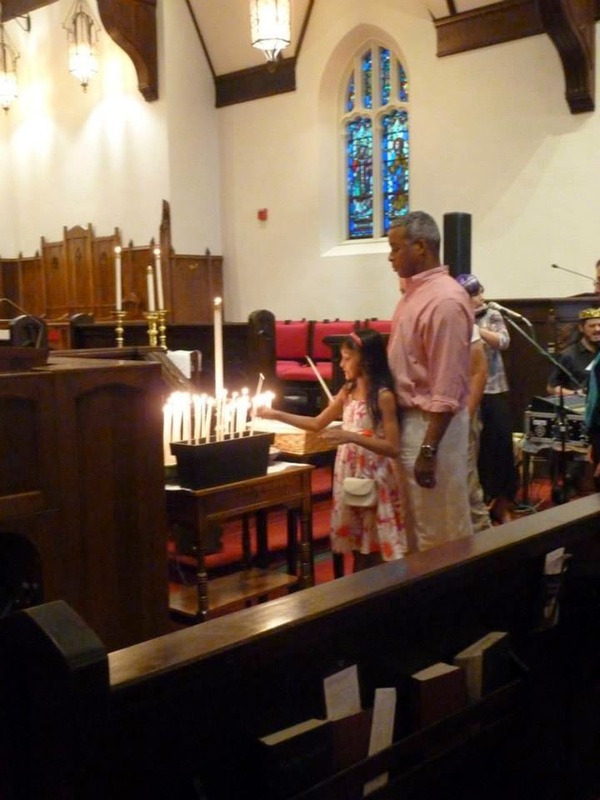 On Friday, August 15 an interfaith group gathered in the beautiful St. Paul’s Episcopal Church for an Interfaith Prayer Vigil. 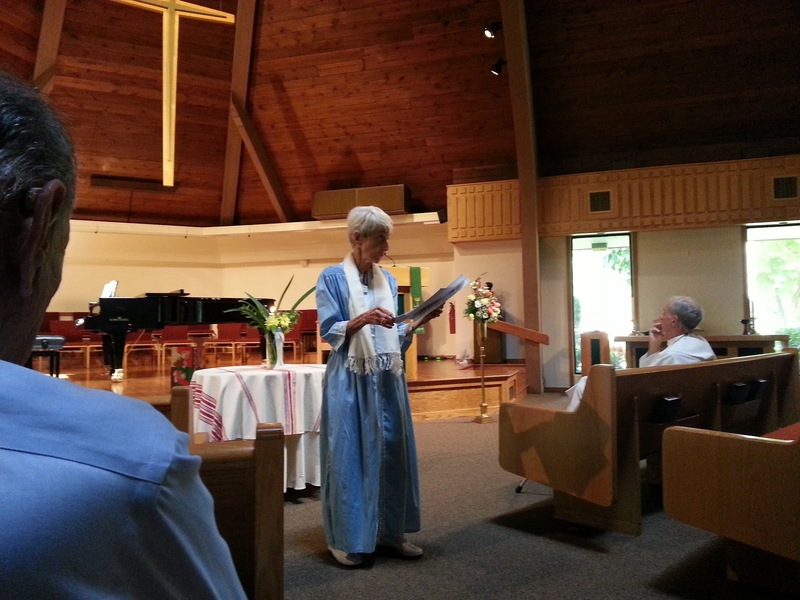 The program began with a “Welcome to all” by the Rev. 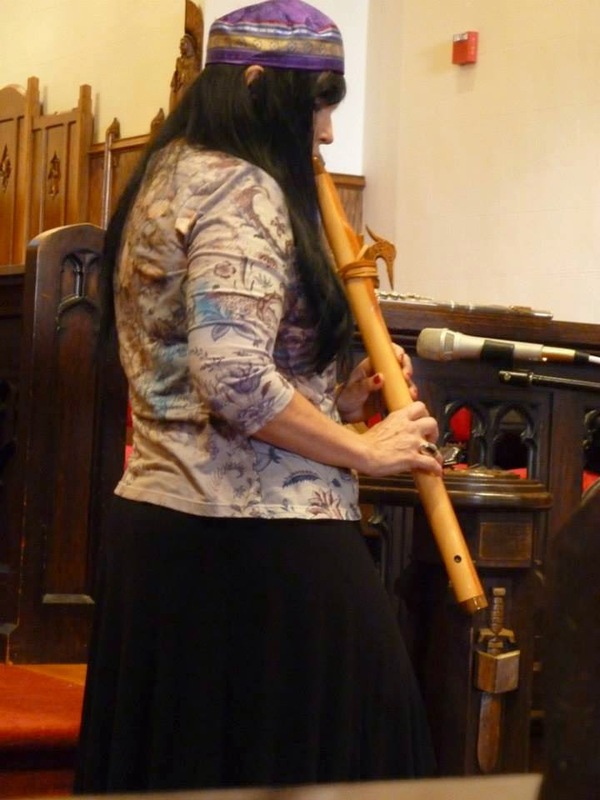 Terri Heydek, and an opening song “Peace, Salaam, Shalom” led by Karen Anson-Neilson. 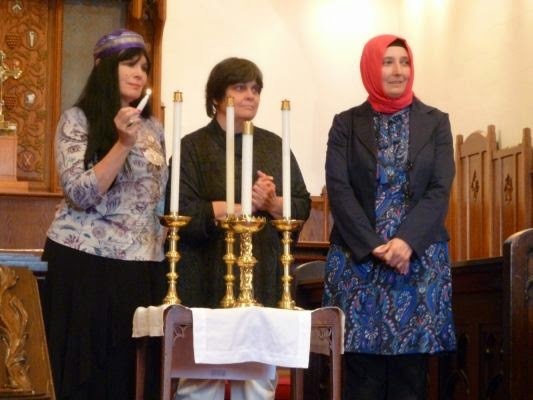 A main purpose of the vigil was to acknowledge the particular beauty, wisdom and truth expressed in the three Abrahamic traditions, and the common foundations that unite us. Two other purposes of the vigil were to create a space in which all of us could pray together and take back our projections so that we could be conduits of the peace we desired. 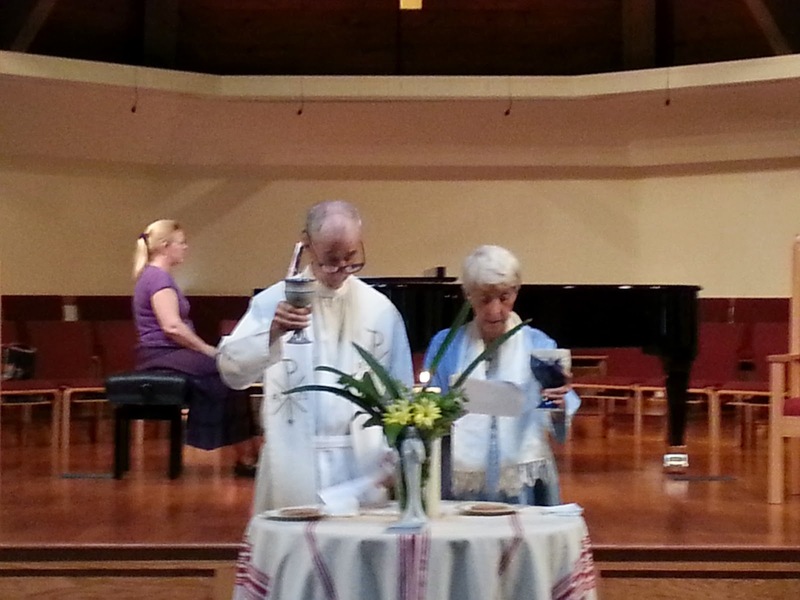 The vigil included invocations to prayer and readings from the three traditions, as well as two harp mediations and music from the Jewish tradition led by Alan and Andalin Bachman of Desert Wind music. The Christian invocation began with the ringing of the Angelus Bells. 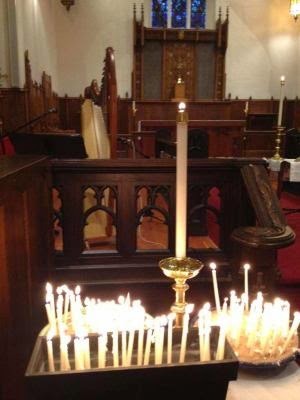 The Jewish faith was acknowledged by the lighting of 3 Shabbat candles. 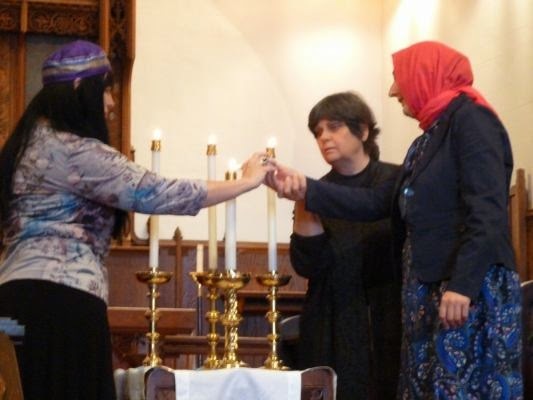 The three candles were lit by a representative of the Jewish, Christian and Muslim traditions: Andalin Bachman, Jewish, lit the first candle, followed by Clare Julian Carbone, representing Christianity and then Zeynep Kariparduc lit a candle on behalf of Muslims. 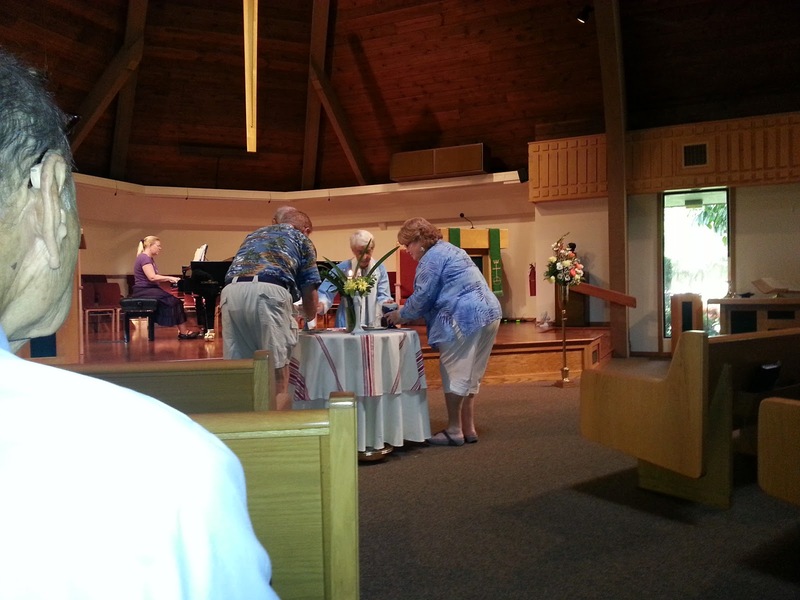 A fourth candle was jointly lit as a representation of the desired unity by all. 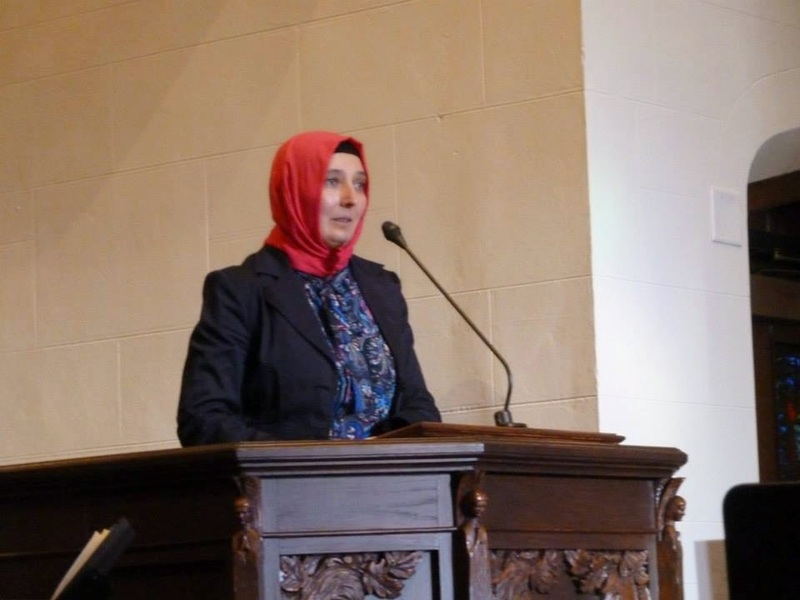 The Muslim invocation was a “Call to Prayer” by Coskun Kariparduc from the Pacifica Institute, Utah. 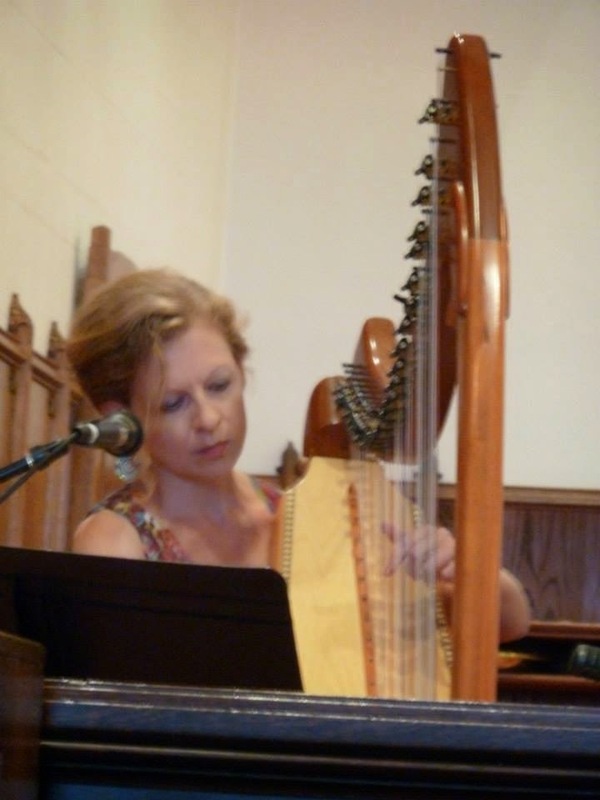 Heidi Hart, a Quaker, then played, “Finlandia by Sibelius,” also known by the titles “Song of Peace” and “Be still my Soul.” Having stilled our souls as we meditated to the beautiful harp music, we began a period of silent prayer for peace. 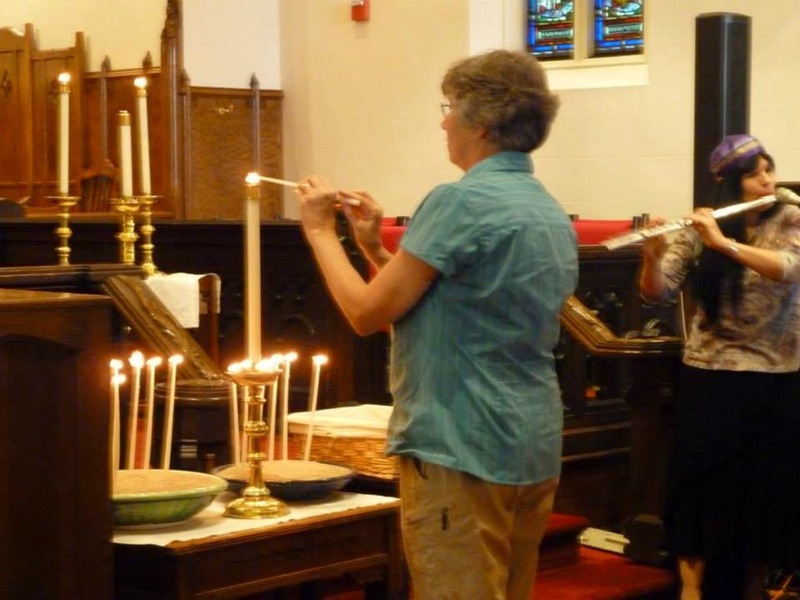 The audience was then invited to come and light a taper candle and place it in a sand bowl, representing our individual presence and our united prayer for peace and healing around the world. After the final candle was lit we joined in a unison prayer “Adoni, Allah, Lord, make us instruments of your peace” which was adapted from a prayer from St. Francis. A final harp meditation was played in remembrance of all our deceased loved ones, as well as those who have died in the many conflicted areas in the world.ion was played in remembrance of all our deceased loved ones, as well as those who have died in the many conflicted areas in the world. A closing blessing acknowledging all three traditions was given by Rev. Trace Browning. A closing song in Hebrew inviting the blessing of Shekhinah was then offered. 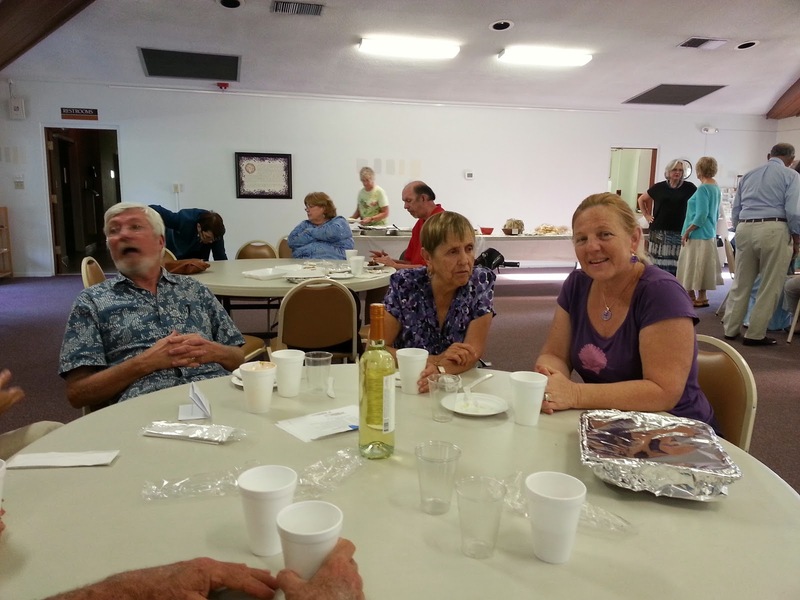 The audience was then invited for delicious light refreshments and fellowship in the Parish hall. 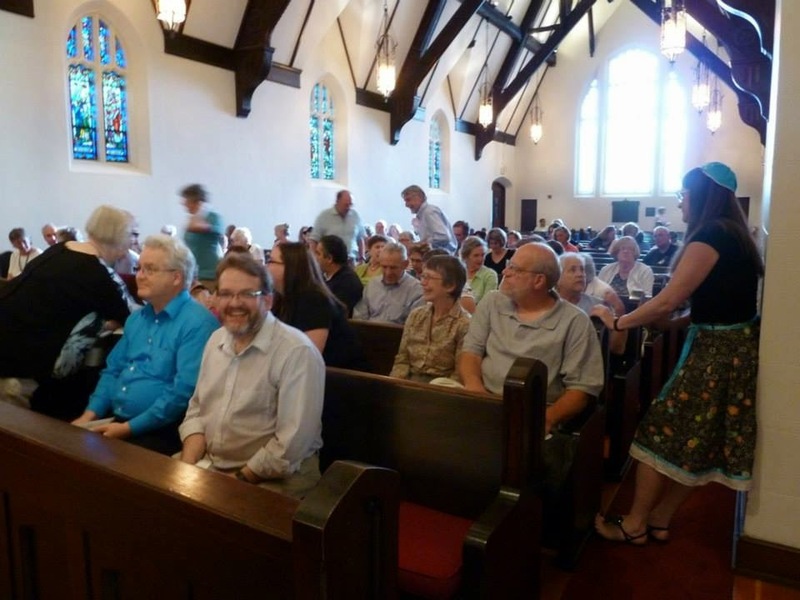 We received many positive responses as people reflected on the event. Some said that they felt “empowered”, which seemed to affirm that the vigil gave people a way to transcend what seemed like impossible barriers and obstacles. In my prayer time today, I was meditating on a passage in Life of the Beloved by Henri Nouwen. as spoken to you with all the force and tenderness that love can hold. holding us, renewing us and transforming us. God says: "you are the Beloved." Message in First Century:The Great Divine Cleanup of the world! Jesus issued a paradigm shift! "It's not coming soon, It is here already!" God is waiting for you to do it with God in collaboration. No wonder nothing is happening! It will not happen unless you collaborate with God!" You will not be able to do it without God and God will not do it without you!" "The power of Parable is to provoke you into thinking!" "The function of the Parable is to lure the people into argument!" Luring, provoking audience into participation! Many people make a decision to tithe to their local non-profit, church or ministry on a regular basis in support of the organization, allowing the organization to carry on its charitable work. It has been my own experience that each time we bless another, God turns around and blesses us; the cycle of giving continues. The following story is taken from “Positive Christianity.” I hope you enjoy it! “It is impossible to out give God. The horn of the infinite plenty shall be opened and pour you out such an overflowing abundance of good that you shall not have room enough to consume it. It was 1985 in Rockford Illinois, 75 miles north of Chicago. Sigmund (name changed) was a struggling student studying to be a writer. He felt that he could progress faster if he had a typewriter. Sigmund asked several people to help him pray for a typewriter. Sigmund tithed on the little that he had, but did it in joy, and full faith in God. All in the prayer group thanked God that he had a typewriter NOW. Although Sigmund had often been writing at his desk when his landlady came to straighten up his apartment, the very next morning she suggested that he go to the basement and get the typewriter some folks who had once lived there had left. She told Sigmund that he could have the typewriter. 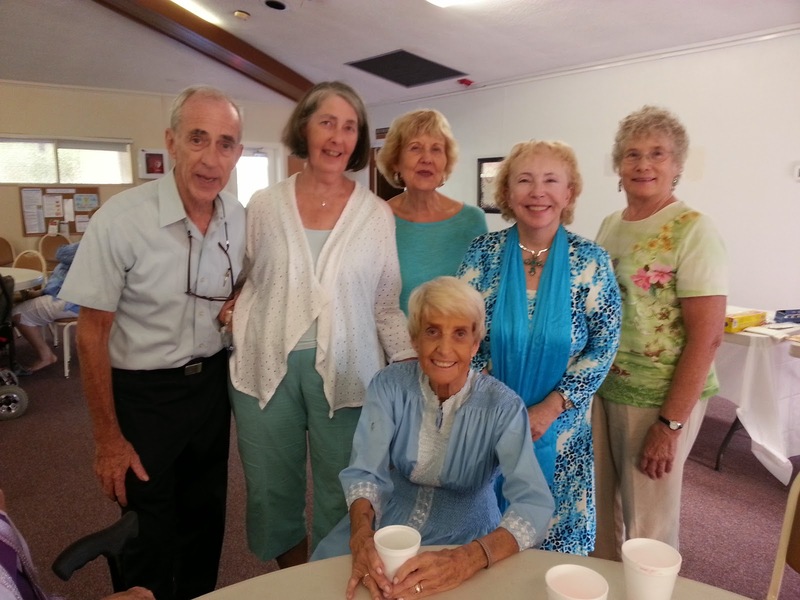 Sigmund phoned and gave the prayer group an account of what had happened. He said, however, that the machine was not new and that he had taken it to have it cleaned and put in working order. The following day Sigmund picked up the typewriter and asked the prayer group to come by and see it. They went to his place. They were quite certain that it was not the first typewriter ever built, but it might have been the second ever manufactured. Does it work? They asked him. Sigmund laughed, and said it does, in a matter of speaking. Sigmund told the prayer group that he finally decided to leave it in the repair shop. ‘The ones for whom you mowed the lawn when the man had his broken ankle?’ The prayer group asked.’ The same. Sigmund said, “It is in perfect condition.” Then Sigmund laughed. He said, ‘I have three typewriters now. 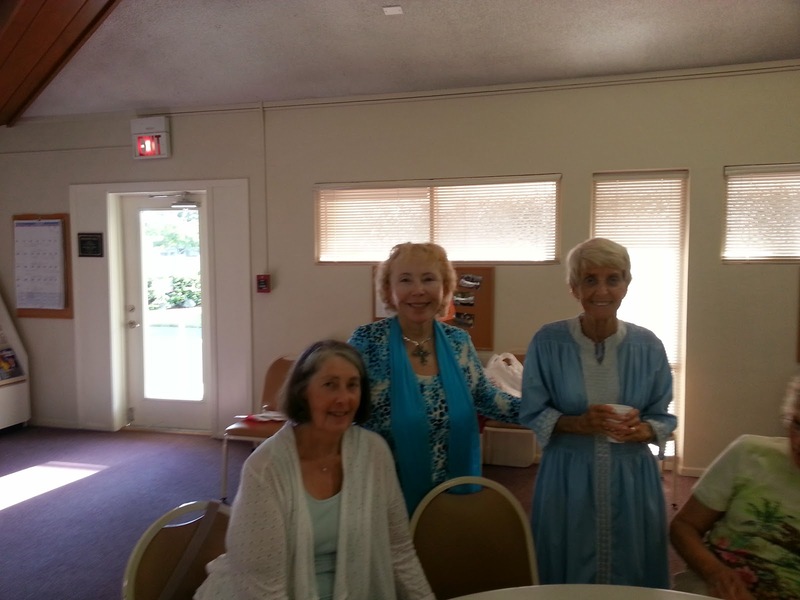 I went for the mail this morning and there was almost a new machine in front of my apartment door with a written note – this is a gift — I thought that perhaps the prayer group had sent it.’ The prayer group said they didn’t know anything about it. Since those years Sigmund has used the tithing and prayer formula time and time again and is today a newspaper writer living in a major city on the East Coast. He is a subscriber to our messages, and probably smiling as he’s reading this. One last part to this story. Remember the old typewriter Sigmund left of the repair shop? It turns out it was quite rare. The repair shop sold it, and sent Sigmund a sizable check. It will be a great day for the church when they canonize Oscar Romero, who stood with the poor and oppressed of El Salvador. He was murdered as he celebrated Mass. that God does not take sides, that we have no priority on God alone. God, we must develop hearts as big as the world ourselves..
To develop a cosmic heart is a moment of profound transformation. We can never be the same again. 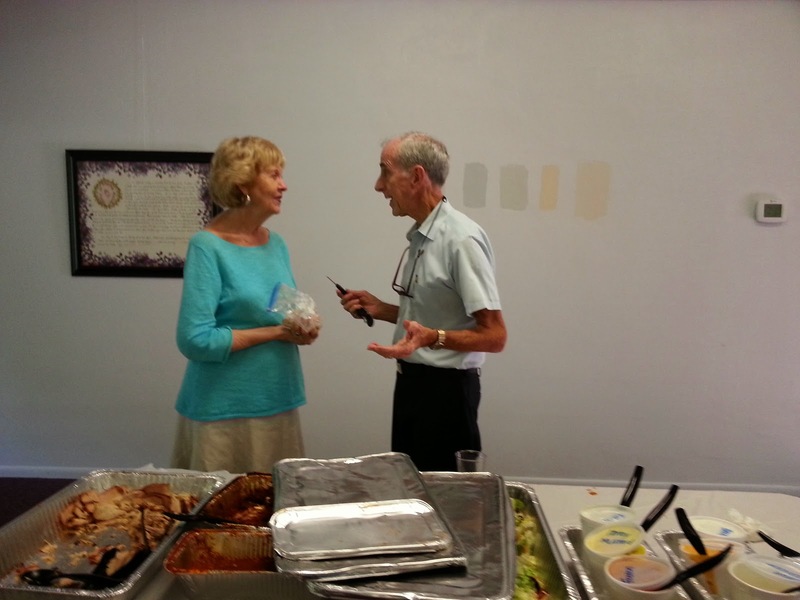 into my race and theirs...."
On Aug. 16, 2014, Mary Mother of Jesus Inclusive Catholic Community Celebrated the 45th Wedding Anniversary of Married Priest Couple Carol Ann and Lee Breyer. 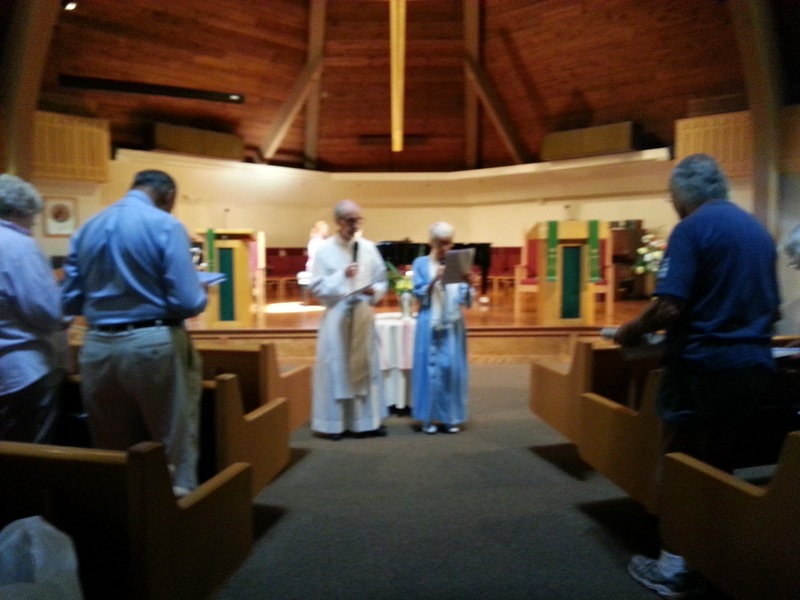 They presided at a beautiful liturgy in honor of the feast of the Assumption of Mary, Mother of Jesus. 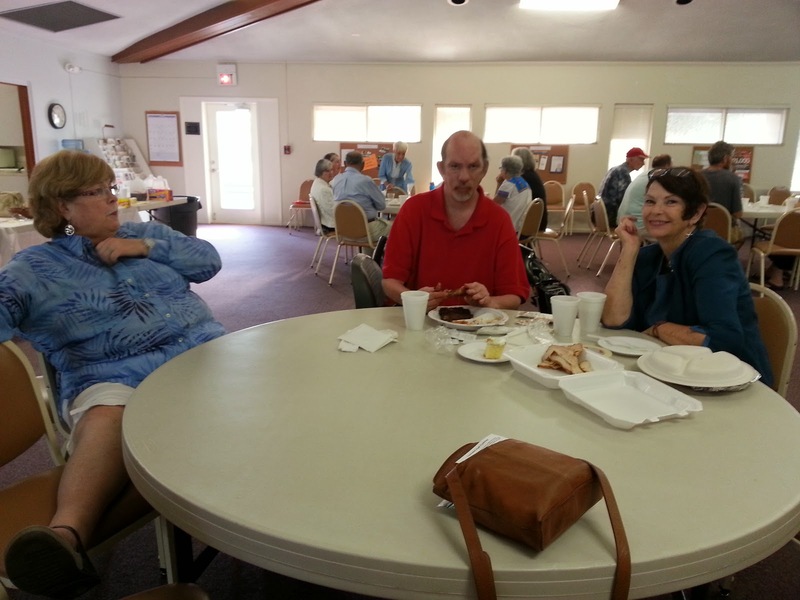 After the liturgy we celebrated with a barbecue meal at St. Andrew UCC Hall. 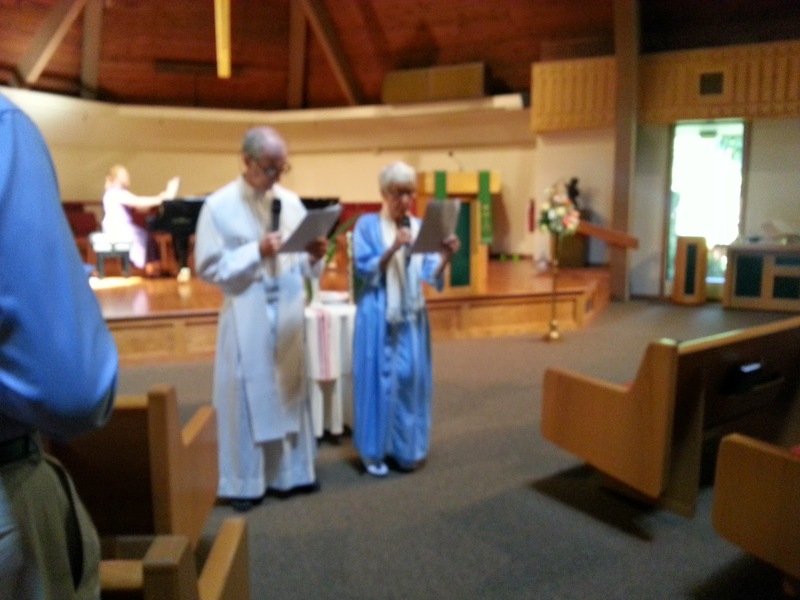 See Anniversary blessing below photos. Today, we give you thanks for many blessings ……..
and for companions on life’s journey. indeed for the beauty of our surroundings here in the Sunshine state. Our hearts are filled with great happiness on this, the forty-fifth wedding anniversary of Lee and Carol Ann Breyer. yet as soft as beach sand when patience and forgiveness are necessary. a flame that never dies, but is as radiant as the morning sun and as warm as an embrace at evening sunset. as vast as the oceans and the Gulf of Mexico and as fresh as a springtime rain. the sharing of dreams, thoughts, emotions …..
refreshing and carefree, as found in a gentle breeze or the breath of a kiss. Indeed, may your marriage continue to blend these four elements to create the perfect balance physically, emotionally, mentally and spiritually. May you hug each other often, laugh a lot, and enjoy each other more with each passing day. still hand in hand, and thanking God for each other! 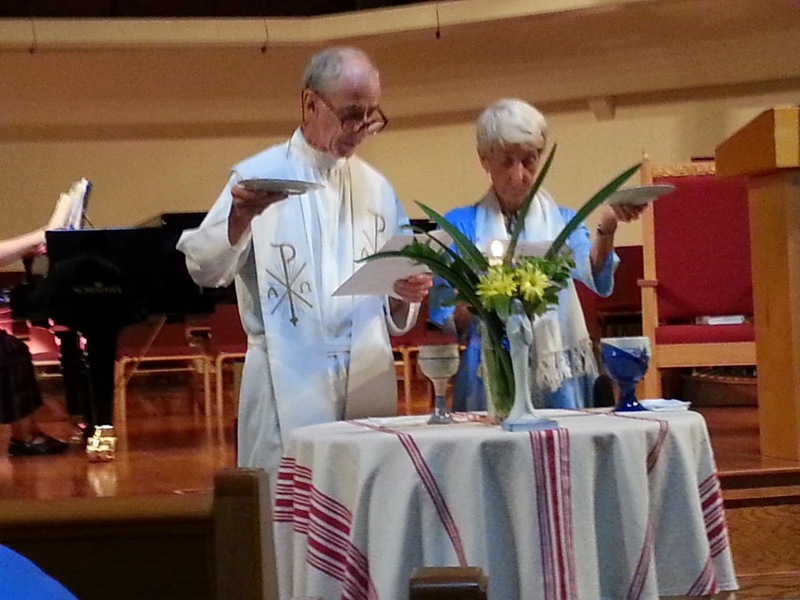 Bless you on your forty-fifth anniversary and all couples this day. Blessed be God ……………. the Creator of all. May it be so, this day, ever and forever. AMEN!